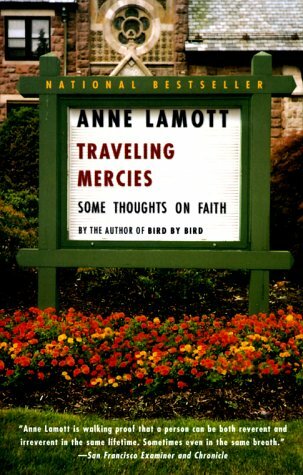 I just finished Traveling Mercies: Some Thoughts on Faith by the wonderful Anne Lamott. It's the second book by her that was recommended to me. This one was wonderful and a book on faith that I needed to read.I realize that I am very, very behind on this series. But I'm taking it "Bird by Bird" as Anne Lamott would say. Anne Lamott chronicles a lot of her struggles in this book, which include drug abuse, alcoholism, and lots of other painful things. Yet, she found pieces of faith that resonated with her. I loved a phrase that she uses in the book, "dusty little red-wagon miracles." Miracles are not usually delivered in beams of light from the sky. They are sometimes sitting in your garage piled a midst junk and dirt and things you haven't used in years. I tend to forget that. I'm not perfect. I screw up, but I do believe that good things are out there. We just can't expect them to be delivered on a silver platter.